Painting is the quickest way to give a room a fresh new look. It is also quite possibly the easiest do-it-yourself project. Most people will spend hours poring over colors, finally choosing the paint, and then just throwing the cheapest paint brushes or rollers in the cart on their way out of the paint section. This is a big mistake. The results you get from a high-quality paint brush will always be much better than with the "whatever's on sale" brush or rollers. A quality paint brush holds more paint, gives you more control and provides a smoother finish. It also covers more with fewer brush strokes, which saves you time. Here's what you need to consider when buying paint brushes. You want paint brushes that have balance. It should feel comfortable in your hand and be easy to control. Paint is held in the space between the bristles, so the more bristles a brush has, the more paint it will hold. A cheaper paint brush won't hold much paint and smears the paint rather than flowing the paint onto the surface. Take a look at a good brush and you'll notice that the bristles have split ends. This is called flagging and helps to provide finer and smoother application. The type of paint you're using determines what bristle you should choose. Use hog hair or China bristle for oil-based paints. However, you can't use hog hair when using water-based paints because the bristles absorb water. Some synthetic brushes use a combination of polyester and nylon – polyester provides stiffness and nylon is soft for a smooth application. The ferrule holds the bristles against the handle and are commonly metal. A high-quality brush will have either a stainless steel or other rust-proof ferrule. Cheaper brushes use lower quality metals and are subject to rusting. Surface area determines what type of brush you use. Wide surfaces warrant a 3 - 4" brush. When trimming around doors, you will want a smaller 1½ - 2" brush. A good brush is thicker at the bottom and narrower at the top. The tapered shape makes the brush stiffer and gives you more control. A cheaper brush has bristles all the same length. Starting a garden can seem like a daunting task, but it doesn’t have to be. Whether you have a plot for a garden, plans for a raised garden or just a few pots around your patio, growing your own fruits and vegetables can be very rewarding. The good news is that you can start small and add some new plants year after year. The better news is that there are some fruits and vegetables that are easy to grow. There are many types of lettuce and other salad greens – head lettuce, leaf lettuce, spinach, arugula, just to name a few. They are easy to maintain, grow quickly and don’t need a lot of room. They prefer the cooler temperatures of spring and fall, rather than the heat of summer. 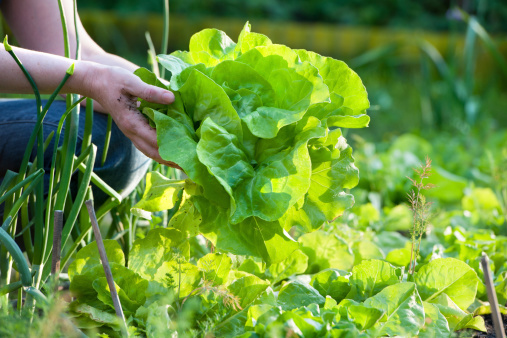 To ensure that you have greens all summer long, you can plant seeds every two weeks. The flavor of summer comes from tomatoes. You can buy starter plants from nurseries and home improvement stores. Tomatoes prefer the sun and can be grown in pots and even upside-down hanging baskets. Opt for heirlooms and grow a variety ranging from green to yellow to purple. Vine cucumber plants need some room because they spread out. They can take over areas of your garden and choke out sun and nutrients from other plants. Opt for bush rather than vine plants. They don’t spread as much and are more resistant to disease. Cucumbers will grow all summer long. A root vegetable, carrots grow until they hit something, then grow around it. If you have rocky soil, you’ll get crooked carrots. Still edible, but not visually appealing. For long, beautiful carrots, you need deep soil. Carrots are ready to harvest when you can see them above the soil. If you like radishes, the good news is that they’re incredibly easy to grow. Spring radishes are mild in flavor, can grow in pots and are ready in three to four weeks. Hot summer soil produces spicier radishes. There are many varieties from which to choose. Beans prefer sun and well-drained soil. As with cucumbers, there are vine and bush types of bean plants. Preferring warm soil, zucchini and other types of squash are perfect to add to your garden later in the year. They can grow just fine in pots or in mounded soil. Zucchini plants do need water in order to flourish. If you want to start even smaller, grow an herb garden. Herbs can be grown in pots or in a garden. Basil, thyme, dill, cilantro, chives… all can be grown with minimal effort, space and maintenance. Whether you want to reduce your carbon footprint, explore the possibilities of sustainable food sources, or simply like the idea of gardening, if you’ve got a back yard with a bit of space, gardening can be rewarding, cost-effective and best of all, delicious! Making sure that your home is safe for you and your family is absolutely essential. If your home was built before 1960, it is important to test for asbestos. 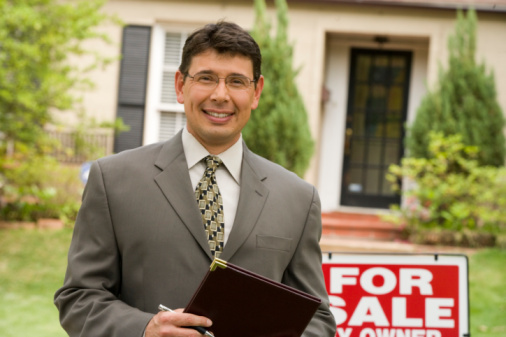 Not only is it important to know if it is present should you decide to sell your home, it is critical for your health. According to World Health Organization estimates, more than 107,000 people die each year from asbestos-related lung cancer, mesothelioma and asbestosis resulting from occupational exposure. Perhaps the most famous person to die from asbestos exposure is Steve McQueen, who was exposed to the material while removing asbestos lagging from pipes aboard a troop ship while in the Marines. 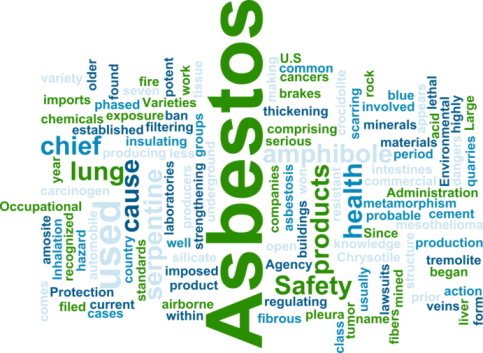 Asbestos is a fibrous, silicate mineral that can be woven into heat- and fire-resistant material in insulation for heating pipes and attics, as well as roofing and siding materials. It was used in homes built before 1960. Asbestos is made of long fibers that can be breathed in easily. When inhaled, these fibers become lodged in internal body tissues, and this can cause cancer. Most people are exposed to a small amount of asbestos every day. Health problems start with prolonged exposure to high amounts of asbestos. It causes mesothelioma, and cancerous tumors form in the linings of the lungs and abdomen. The best thing you can do is to leave the material alone if it is in good condition. Unless the material is damaged and fibers are released and inhaled, you are not in danger. If you find damaged material in your home that may contain asbestos, don’t sand, scrape or vacuum it. Asbestos should only be removed by trained professionals to limit exposure. If you are worried about asbestos in your home, call a specialist to do an inspection. If there is damage or deterioration, the technician will recommend remediation. Making sure that your home is safe for you and your family is absolutely essential. If your home was built before 1960, it is important to test for radon. Not only is it important to know if it is present if you decide to sell your home, it is critical for your health. Radon is known to cause cancer through repeated exposure. According to EPA estimates, radon is the number one cause of lung cancer among nonsmokers, with 20,000 deaths per year on average. It is an odorless, colorless gas produced when uranium in the soil breaks down. Radon enters your home through the foundation, where the foundation comes in contact with the soil. If radon is present, it is drawn in to the home because the air pressure inside is usually less than that of the soil. It acts as a vacuum, drawing radon gas in through gaps, cracks and cavities in walls where plumbing enters, and through construction joints. Radon is a fairly common occurrence. One in 15 homes has radon levels high enough that the U.S. government recommends that action is necessary to control the leakage. A simple home test can tell you if radon is above the safe level. You can purchase a test kit from Kansas State University’s National Radon Program Services for about $15. The kit is placed in the lowest lived-in area of the house, generally the first floor or basement, for three days or four days. If testing reveals an unsafe level of radon in the home, it is important to take action immediately. Radon remediation methods are highly effective. Radon mitigation is like many other home repairs — you may want to get a few estimates before choosing your radon contractor. At this time of year, you’re probably getting ready to plant your garden and you’re buying seeds. Whether its flowers or vegetables, you can help your garden flourish from year to year AND save money by saving seeds. It takes a little time but it’s actually a very simple process. There is a specific time that is optimal for harvesting seeds. For flowers, you should cut flower heads when their seed pods have dried out or shortly before. Hang the heads upside down in a paper bag to dry. Once they are dry, remove the seeds. Separate them as much as possible from chaff and other plant material. For fruits and vegetables, seeds should be harvested once the fruit has become fully ripe or overripe. Thoroughly wash them before drying. For podded vegetables such as beans and peas, let the seeds dry in their pods on the plants before you gather them. Avoiding direct sunlight, dry your seeds on a ceramic or glass plate. Make sure they are completely dry before storing them, otherwise they will develop mold. Store dried seeds in paper envelopes. Make sure to label them! Many seeds can remain viable for several years after being harvested. Put your envelopes in an airtight container and store the container in a cool, dark, and dry location. It’s a good idea to add a packet of desiccant to absorb moisture. Save one from a pill bottle.